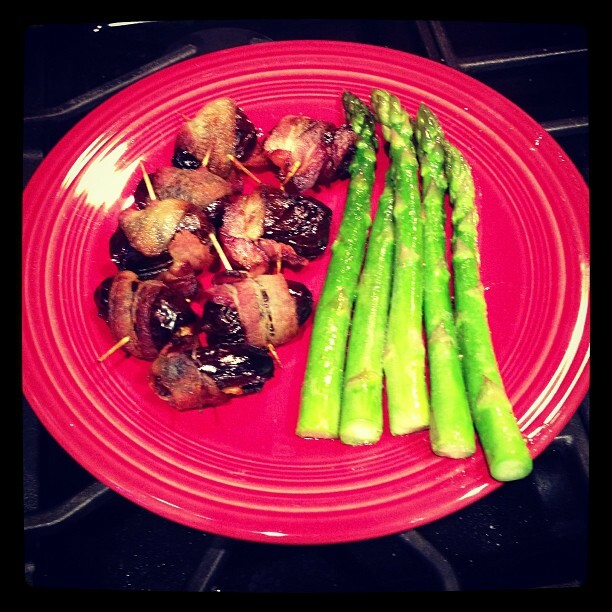 Dated, stuffed with walnuts, wrapped in bacon + some asparagus. It has been way too long since I’ve written. The last time I did a series of posts, I was doing a cleansing diet, and logging it to make sure I followed. Well, my 14 day cleanse ended on day 10 when I just completely lost my appetite. Sure, I lost some weight, but it gradually came back. Lots of other things happened, like 2 promotions at work, that shifted my schedule (even more than having an infant, now toddler). But, I stuck with the gym. I’ve been going to Level4 Crossfit in Seattle for over a year now. I’m hitting about 4 classes a week, and hope to be doing less traveling here in the coming weeks. So, now I’m on another food thing, It’s more than just a food thing though. I’m participating in the LEANing Challenge at the gym. We’re 2 weeks in (out of 7), and things are going well. The picture on this post is what I made for dinner tonight. The dates were a bit of a splurge, but I love dates, and I love bacon. This works for me, I’m able to find plenty to eat, steering clear of gluten and dairy, and just cooking real food at home. I don’t want to talk about results yet, yes the scale is lower than it was two weeks ago, but there is a long way to go. 2 and a half times as far as I’ve come already, that’s how long we have to go.